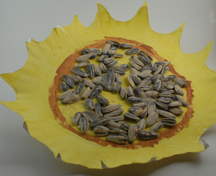 What You Need: Paper plate, glue, pencil, brown and yellow tempera paints, paintbrush, scissors, sunflower seeds in shell. How You Make It: Use pencil to draw “scallops” all around edge of paper plate and cut along the lines. Paint entire front of plate yellow. Paint brown circle around middle of plate. 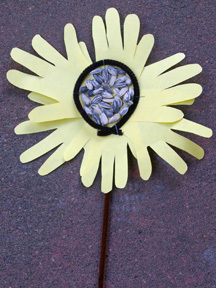 Once dry, use glue to adhere sunflower seeds in center.